Unbeatable service fees; which when combined with our exclusive special rates and free nights, many times this service pays for itself! Member of the ICT (Costa Rica Tourist Board), Canatur (Costa Rica National Chamber of Tourism) and BBB (Better Business Buraeu). Accommodation, transportation and tour reservations and confirmations with traceable electronic transfer prepayments, 30 day reconfirmation, 14 day and 7 day reconfirmations for all reservations = Smooth Sailing. Credit card acceptance fee is waived with the Full Service plan. 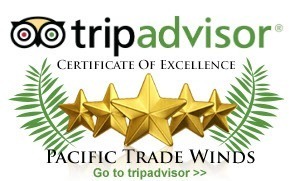 Pacific Trade Winds S.A. is a full service travel provider, providing personalized, attentive service. We only utilize the best tour operators and transportation companies (all are ICT certified for safety standards, have insurance, and provide overall superior experiences). We perform a series of 4 reconfirmations of every aspect of your vacation prior to your vouchers being sent. We take pride in our work and provide outstanding customer service for a safe, stress free vacation which includes 24/365 emergency in country assistance when you are traveling in Costa Rica. We do not have any hidden fees or surprises. We include everything that is listed in your itemized itinerary including Sales and Turismo taxes (13 percent), the mandatory basic insurance with rental cars (often 40-50 percent of the total rental price), toll free English and Spanish spoken customer service, and credit card acceptance fees (which in Costa Rica averages 8-10 percent). These items are typically not brought up until you sign the official authorization slip (unfortunately in many cases this is when you are already in the country and have utilized the service, leaving you little to no leverage) and can cost as much as 40-50 percent of your total trip. Our rates include all of the aforementioned as well as all of the services that we provide. When the Full Service Plan is applied, we will apply promotional rates and free nights when available. These offers are usually based on private contracts that our business has made with the providers. Individual cost breakdowns are strictly prohibited for this reason. In almost every case when totaled up in the end, you will end up paying less with us and receive all of the services we provide while enjoying a stress free smooth sailing vacation. We hope you choose our services and are confident you will be happy you did so. This plan is for those of you that have done your research and know exactly what you want on a day to day basis. If you choose Strictly Reservations, you must fill in your complete day by day itinerary including desired hotel names, tours and transportation in the Comments Box on our “Custom Vacation Form”. This plan is subject to a 5 percent credit card acceptance and filing fee. In short, the Strictly Reservations plan is a safe way for you to make reservations with secure, traceable payment.